This past weekend was the 4th Annual International Tamale Festival, held right by MacArthur Park/Mama's Hot Tamales in LA. The event was free and street parking wasn't too bad around the park. The festival offered, besides tamales of course, various Mexican eats like Tortas, Platanos, and drinks like horchata and aguas frescas. I was obviously there for the tamales though. I had hopes for a blue corn tamale, but that didn't happen so I just got what I could. Mama's International Tamales had some of the most interesting and varied offerings there. Pictured below are the beef adobo and the chicken mole tamales. Both were great! I really liked the beef adobo a lot, although it was pretty spicy. Drank 1/2 bottle of water but it was worth it. The chicken mole was not spicy at all but was also very good. I thought it was really messy as a tamale, but the taste of the corn tamale + mole sauce definitely worked. Another interesting vendor was the White Girl Tamale Maker (aka La Guera Tamalera), which boasts authentic VeraCruz style (I don't know what that would be like, so I can't attest to that). Sounds weird? 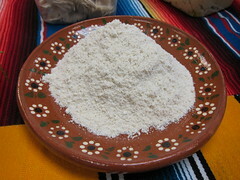 It also happens to be the only organic offering and also had very interesting sweet tamales creation. Pictured below we had the chicken with green chile (left), and on the right was the fig-nana and also the ginger peach tamales. The chicken w/ green chile was delicious and it might actually be my favorite of the day. Maybe. 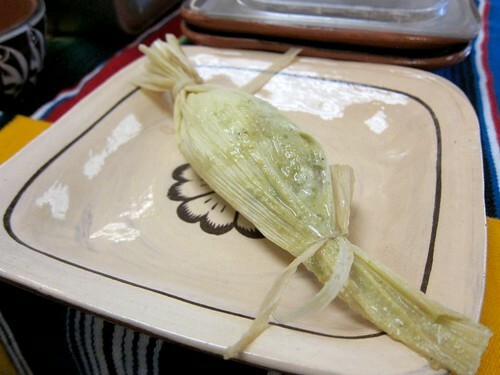 With a tastier corn, the tamale was also not that spicy, which suits me just fine since it was still very flavorful. The fig-nana and peach tamales were very sweet. They were tasty, but funny thing is that eating the peach tamale reminds me basically of peach cobbler of sorts. These organic tamales were $5 each, compared to $3 tamales from everywhere else. Overall a great lunch on a Saturday evening, followed by a short walk through the park (to the car). Will definitely return next year!